Nationwide tiger survey in the country, conducted entirely by a team of Bhutanese nationals, found an increase in the number of tigers in the country. From the previous estimated 75, the number has risen to 103. “Tigers are considered very precious in our country,” said the Prime Minister, Tshering Tobgay. He said the existence of such a good number is a sign of good ecosystem. The Department of Forest and Park Services of the Ministry of Agriculture and Forest carried out the nationwide re-validation survey of tigers from March 2014 to March 2015. Camera traps were set up in 1,129 grids. Bhutan is one of the 13 countries in the world where tigers still roam in the forest. an enquiry. I have just watched your interesting video on the tiger census on Youtube. 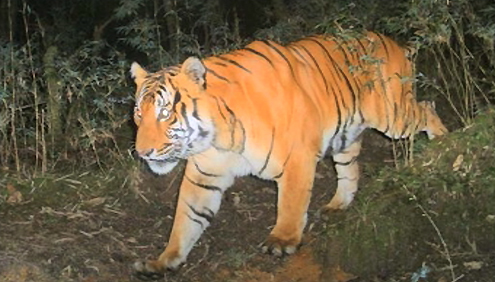 My question: Is the tiger – shown during the last seconds of this video – a tiger filmed as part of the Bhutan tiger census or just archive footage? Does is show a Bhutanese tiger? The tigers shown in Bhutan are actually of Indian origin, migrated to that place.